I found this card on the sidewalk the weekend before a Thanksgiving trip to see my mom, dad, brother, sister-in-law, niece, and nephew, who all live in a pretty city in the hills of North Carolina now. It was a good visit. I ate a lot of food, got drunk one night with my wife and my brother and his wife while my mom babysat their kids, played games with and read stories to my sweet, boisterous four-year-old niece, laughed at the comedic stylings of my two-year-old nephew, went on a nice walk with my dad, and spent a lot of time with my mom and the new love of her life, a tender little chunk of fur named Shaggy that she rescued from the dog pound a few months ago. “It’s nice to have something to take care of,” my mom said at one point, petting Shaggy, who doesn’t ever like to be apart from her for even a few minutes. My mom also helps take care of my niece and nephew now, and I got to witness some of this care, which brought back to me the way she was with my brother and me when we were little. It brought it back in a visceral way, something about the way she leaned down to help my niece and nephew color some pages with crayons. I could see it all happening years before, the soft voice encouraging my brother and me. She has always been a superstar of care, reaching out and holding tight to her loved ones. So I’m thinking of that today as I return to my daily life, which of course often includes a stop at my baseball card collection to try to make sense of this world. The collection continues, by little inexplicable miracles, to grow. I keep finding cards! 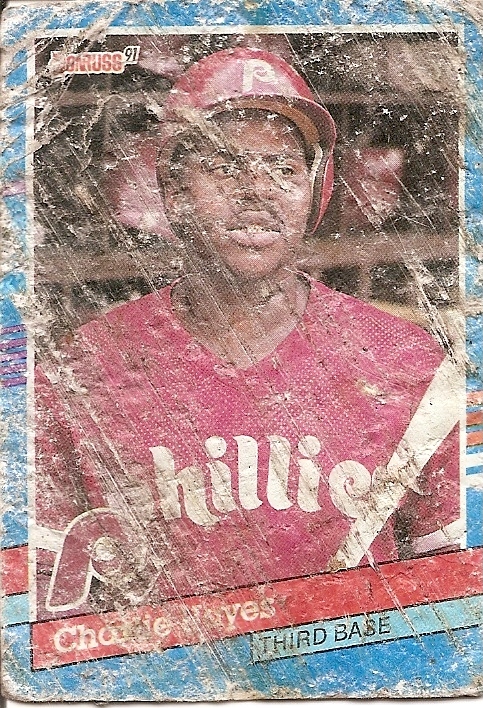 I found this 1991 Charlie Hayes card just after I had finished one of my morning jogs up and down the streets of my neighborhood. I was walking up Western Avenue to get some quarters from the machine in the laundromat on Thomas. I noticed a little flash of muted color and looked down. The card was wet and had almost fused itself to the ground. If I hadn’t noticed it and carefully pried it up it would have disintegrated soon. It’s supposed to snow tomorrow here in Chicago, signaling the start of a winter that this card would not have survived. Nonetheless, I’m glad to have rescued the card from the world’s relentless all-encompassing road to ruin. All cards will disintegrate. Cover them in plastic if you want. Shield them from the elements. Pray for them morning, noon, and night. It’s only a matter of time. It makes you wonder why you hold on at all. Last night, in bed, I dropped into and then out of a shallow sleep, then I guess I started thrashing around a little, a physical manifestation of some mental anguish that had seized me like an owl snatching a vole in its talons. “Are you OK?” my wife asked. “I don’t want to die,” I said. She tried to calm me down, and her touch actually did help. She tried words too, but words only go so far. Words, at best, are like the plastic covering protecting cards. Plastic won’t hold back the inevitable. “That won’t happen for a long time,” she said. “Ah,” I said. (It was sort of a muted scream.) My thoughts were: But it might happen at any time and, more powerfully, But it will happen. There aren’t any words to stave off that fact, especially at certain times of the night when the veil of day-to-day life drops. It will happen. So what do we do with our time here? What do we do with this thin disintegrating gift? You are currently browsing the archives for the Charlie Hayes category.